Make your home an architectural wonder in the most affordable and unique way possible using decorative metal wall panels! Decorating using unique decorative metal wall panels is the easiest way of turning walls into magnificent focal points. Your space is in dire need of a decorative wall panel if you want to enhance its look and give it more character. To ensure that you get the right piece for your home, check out our quick buying guide below. Since decorative metal wall panels are made to be mounted on walls, they need to be lightweight and portable. The lightest material available is sheet metal. It looks heavy visually especially when it's laser cut, but it is lightweight enough that it can stay on any wall once it is mounted. As for portability, it will prove to be useful when you move between homes. It’s our job to inform you that the market is currently riddled with decorative wall panels made of a combination of wood and metal. If you find yourself liking a piece made of both wood and metal, then make sure the framing is sealed to offer a long-lasting performance. Add a beautiful work of art to your space with the Clemmie Panel Wall Decor by August Grove. The framing is given a natural tan finish to exude a relaxed vibe that's also being lifted up by the symmetrical and organic pattern of the piece. It inspires natural materials and landscapes, plus it can complement contemporary aesthetics seamlessly. This floral decorative panel for walls will transform your living room with instant style. With its high-quality construction and floral pattern, it will create an upscale space and enhance your interior decor at the same time. Check it out as we are sure you'll love the beautiful champagne and bronze flowers. This simple wrought metal and wood decorative panel is aesthetically superior with its ability to seamlessly fit with any home setting or style. The design features a rather peaceful and natural appearance, capable of enhancing any environment. It's best mounted on a wall as it will arrive on your doorstep ready to hang. This masterpiece by Zipcode Design creates a beautiful effect in natural lighting. 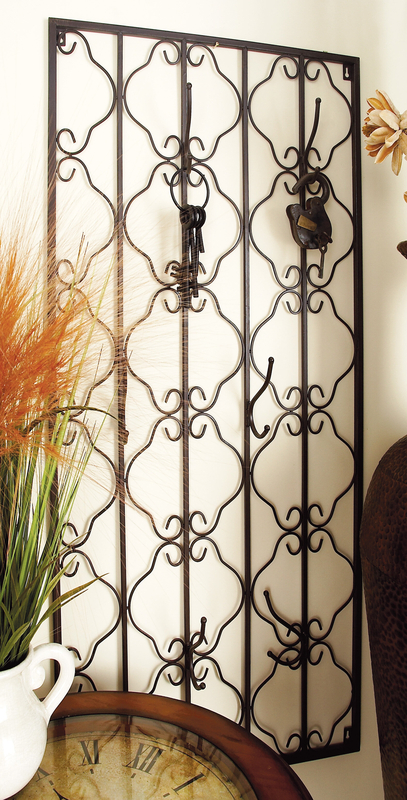 It's a perfect complement to a garden or an outdoor living space. Compared to all other decorative metal wall panels available in the market today, this one has a very open and light pattern of three oversized poppies. This piece is brilliant for adding an ambient visual effect to a wall. The natural distressed finish of the product can work in any living room, but what we love about this artwork is it can easily be coated in the color that you love. The wooden frame has been pre-sealed with a water-born UV decking sealant to ensure years of use. This wood and metal panel is rather large so it can easily fill an empty wall. This antiqued wood and metal wall panel has an intricate pattern with a classic style. Because of its size, it is a panel that can be used in creating a stylish yet understated room divider or a unique piece of art mounted on a wall. The highlight of this product is its top-quality metal which ensures a long-lasting performance of beautifying your private space. The perfect alternative to paintings and other types of wall decor, this wood and metal decorative wall panel can be your room's focal point with its sophisticated pattern and striking finish. It has the ability to transform your space's simple decor into an extraordinary room with a ton of character. This set of three mirror wall panels has a geometric pattern with a contemporary silhouette. The mirror accents are modeled after bubbles blown in the air. What makes this an excellent option for modern living spaces is its sophisticated and remarkable design that is sure to turn heads and stimulate everyone's senses at the same time. Last but certainly not the least is this botanical-inspired decorative steel wall panel by Be Metal Be. It's a premium product that has been stripped of a premium price tag to offer homeowners with the perfect accent to their home decor. The screen is flat in order to maximize its potential uses, plus it comes with predrilled holes in order to ensure a quick and easy installation.